The Cuba and the Caribbean Special Report explores the mysteries, inventions, culture, challenges and partnerships intertwined between the islands and its people and UM. Over nine months, UM News, a part of University Communications at the University of Miami, gathered the research, science, and study occurring throughout the Caribbean Basin into a comprehensive database. There was work happening in the waters around the exquisite islands favored by millions of tourists the world over. The atmosphere above holds secrets critical to the world’s climatic conditions and the Atlantic hurricane season. 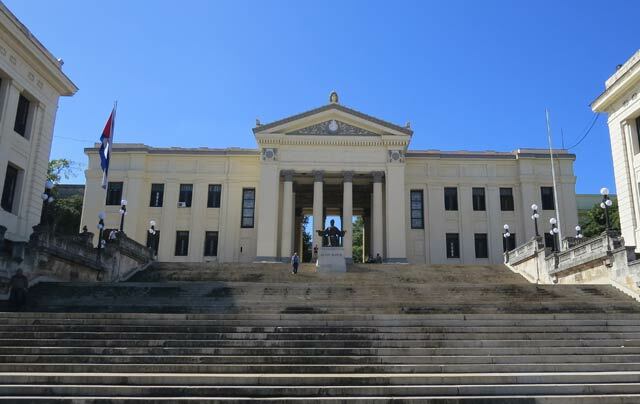 One of the first partnership agreements signed by the University of Miami was with the University of Havana, Cuba, pictured here. In addition to dipping a toe into the tepid waters, the basin holds marvelous stories about the people of the islands – both past and present – and about its cultures, art and music, and its enduring spirit to survive sometimes unlivable and unexplainable catastrophes. Why is it that Haiti – the poorest country in the Western Hemisphere – seems to be hit repeatedly with unspeakable hardship? There was the 2010 earthquake in Port-au-Prince, the impact of Hurricane Matthew in 2016, and the massive flooding caused by Hurricane Ike in 2008, whose destruction was chronicled in the poignant photos by Miami Herald photographer Patrick Farrell, a UM alumnus who won a Pulitzer Prize for his breaking news photography of that event. There are collaborations occurring between the University of Miami and institutions in a number of countries around health care, the humanities, invention and technology. Strong bonds are being established to support future hemispheric initiatives at UM to connect the Americas and the Caribbean. The University’s relationship with Cuba, both past and present, is undeniable, complex, rewarding, and challenging. Miami is unique in its diversity and its geographic positioning. It is a city that ebbs and flows with its educational, cultural and soul-searching ties to Cuba and the Caribbean. UM faculty, exercising academic freedom in their pursuit of knowledge, continue visits to the island, converse with peers and forge relationships. This special report features more than 75 articles and 40 videos highlighting the research, partnerships, study and training that faculty, students, staff and alumni are involved in throughout the Caribbean Basin. Dozens upon dozens of sources were contacted and quoted. All 11 schools and colleges and six centers and institutes at the University of Miami are represented. More than 35 editors, writers, photographers and videographers with University Communications and its communications partners throughout the University of Miami contributed to this report. The report is a living document that will continue to be updated with news worth noting. Interaction is key and encouraged through social engagement and direct comments to the project editors. One of the primary roles of an institution of higher education is to share knowledge and create dialogue.